Wright Motorsports celebrated their second podium result of this year‘s IMSA SportsCar Championship with Porsche works driver Patrick Long and Porsche Selected Driver Christina Nielsen. At round nine of the GTLM class, Earl Bamber and Laurens Vanthoor secured fifth place in the Porsche 911 RSR with the starting number 912. Wright Motorsports celebrated their second podium result of this year‘s IMSA SportsCar Championship on Sunday with Porsche works driver Patrick Long (USA) and Porsche Selected Driver Christina Nielsen (Denmark). After winning the Road America race with the Porsche 911 GT3 R, they followed up with another top result, scoring second in the GTD class at the Virginia International Raceway. At round nine of the GTLM class, Earl Bamber (New Zealand) and Laurens Vanthoor (Belgium) secured fifth place in the Porsche 911 RSR with the starting number 912. A technical defect after about an hour put an early end to the race for the sister car shared by Nick Tandy (Great Britain) and Patrick Pilet (France). Although Pilet took up the race from second on the grid for the Porsche GT Team, the first grid row did not bring any luck for the number 911 vehicle. After handing the car off to Tandy, the 33-year-old had to park the car trackside with damage to the drive train while running in the lead. The 510 hp Porsche 911 RSR driven by Bamber and Vanthoor received a drive-through penalty after an incident in the first lap. In the race over two hours and 40 minutes, the pair doggedly worked their way forward from the back of the field. At times, Vanthoor looked good for a podium result on the 5.263-kilometre circuit, and ultimately saw the flag in fifth place after 88 laps. This puts Porsche on third place in the manufacturers’ classification. In the qualifying for the IMSA SportsCar Championship, the Porsche 911 RSR with the starting number 911 was driven by Patrick Pilet. On a track wet with rain, the Frenchman achieved his fastest time on the last lap. With 1:56.170 minutes, he secured position two in the close session. On Sunday, he joins forces with Nick Tandy (Great Britain) to tackle the race over two hours and 40 minutes. Earl Bamber planted the car with the starting number 912 on P8 with a time of 1:57.874 minutes. The New Zealander will drive the first stint at round nine of the championship before handing the car to his teammate Laurens Vanthoor (Belgium). Shortly before the qualifying session on the racetrack in the US state of Virginia, the sun shone and temperatures had reached 28 degrees Celsius. However, just before the 15-minute session began at noon, a heavy rain fell. Due to persistent showers, the two 911 RSR went out on the 5.263-kilometre circuit on wet tyres. The qualifying for the GTD class, which had taken place a few minutes earlier, had started in dry conditions. Wright Motorsports opted for slicks for the Porsche 911 GT3 R and was only surprised by rain in the final laps. Porsche works driver Patrick Long (USA) claimed the sixth grid spot with a time of 1:44.758 minutes. For the race, he shares driving duties with Porsche Selected Driver Christina Nielsen (DK). The racetrack on the North Carolina state border can look back on an eventful history: In 1971, Porsche legends Hurley Haywood and Peter Gregg won the first ever IMSA GT race there with the Porsche 914-6 GT. As a consequence of the oil crisis, the racetrack closed its gates in 1974 and reopened in the year 2000 as America’s first motorsport venue offering a wide range of recreational facilities to racing fans and their families. The racer from Weissach, which has already notched up victories at the 12 Hours of Sebring and the Mid-Ohio race so far this season, tackles the infamously cutthroat GTLM class against strong opposition from BMW, Chevrolet and Ford. In the GTD class, Porsche’s customer team Wright Motorsports campaigns the 911 GT3 R, which recently celebrated its first win this year in the USA at Road America. The prototypes will be absent at the venerable 5.263-kilometre racetrack close to Alton in the US state of Virginia for the second time this season. This means that overall victory will go to a GT car. The cockpit of the #911 Porsche 911 RSR is shared by Patrick Pilet (France) and Nick Tandy (Great Britain), the winners of the 12 Hours of Sebring. The Mid-Ohio winners Laurens Vanthoor (Belgium) and Earl Bamber (New Zealand) share driving duties in the second 911 RSR (#912) fielded by the Porsche GT Team. In the GTD class, the Porsche customer team Wright Motorsports competes with the 911 GT3 R. Sharing driving duties in the #58 car are the works driver Patrick Long (USA) and Porsche Selected Driver Christina Nielsen (Denmark), who recently scored their first win of the season at Road America. For the second race season, the 911 RSR was optimised primarily in the setup. Depending on the size of the restrictor, the motor, which is positioned in front of the rear axle, puts out around 375 kW (510 hp). The particularly large rear diffuser combined with a top-mounted rear wing provides strong downforce and aerodynamic efficiency. The ca. 368kW (500 hp) 911 GT3 R was designed for worldwide GT3 series. The vehicle is campaigned by customer teams, for whom Porsche has provided an evo-kit in 2018. The tenth and penultimate round of the IMSA SportsCar Championship will be contested from 7 to 9 September at Laguna Seca in the US state of California. 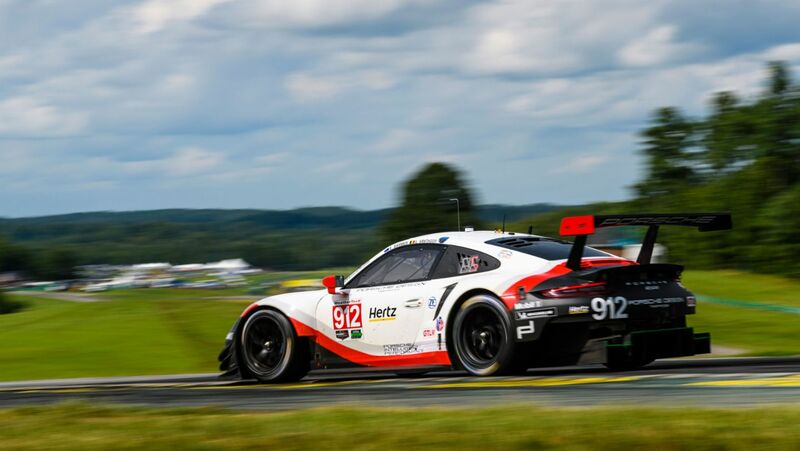 At round eight of the IMSA SportsCar Championship, the Porsche GT Team secured positions four and five. Laurens Vanthoor and Earl Bamber finished third in the GTLM class with the Porsche 911 RSR. Porsche concluded round six of the IMSA in Bowmanville/Canada on positions four and six.